Carol Frey, M.D. was a lead author on a confirmatory study (“Radial Extracorporeal Shock Wave Therapy Is Safe and Effective in the Treatment of Chronic Recalcitrant Plantar Fasciitis”) published in The American Journal of Sports Medicine determining the effectiveness and safety of extracorporeal shockwave therapy. 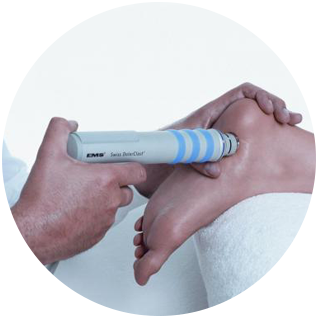 Extracorporeal shockwave therapy is used to treat a growing number of tendon, joint and muscle conditions. These include tennis elbow, where results in double blind studies are reported as excellent; chronic tendinitis of the knee and shoulder rotator cuff pain, achilles tendinitis, hamstring tendinitis and plantar fasciitis have also been treated successfully. The above conditions are often difficult to treat using other methods and can become chronic. With ESWT patients report reduced pain and faster healing, without significant adverse side effects. However, the treatment has proven challenging to verify categorically in large controlled studies, in part because the therapist and patient are aware whether or not they are in the treatment cohort or the sham cohort. ESWT is also used to promote bone healing and treat bone necrosis. It is an effective alternative to surgical treatment of non-healing fractures.